The awards season is upon us. The next few months will be dominated by award ceremonies for film. The nominations for the BAFTAs were announced this week. Although I am usually more interested in award ceremonies for television programmes (as if you hadn’t guessed by the number of blog posts I watch more tv! ), I was quite impressed by this year’s selections. Usually I don’t mind if I miss the ceremony (whereas I am glued to the television baftas and follow the bafta craft awards hashtag on Twitter for the tv equivalents) but the nominees this year include films that I want to see and films that I have actually seen as opposed to a long list of films I have never heard of. The film that has received the most nominations – 11 in total– is The Grand Budapest Hotel. I am very pleased that it has so many nominations as I absolutely loved the film. Prior to seeing this film in the cinema I had only ever seen one Wes Anderson film before. As much as I loved the independent, arty feel of Moonrise Kingdom, I wasn’t sure how well the style would translate to what is clearly a comedy. After watching the trailer and seeing the great cast list for the film (including Anderson regulars Bill Murray and Edward Norton), I went to see it in the cinema. It is so funny and well put-together. Ralph Fiennes puts in an amazing performance as the hotel’s concierge Monsieur Gustave H which he has deservedly earned a leading actor nomination for. I was surprised that it had received so many nominations as it was released in Spring 2014 and usually the productions that get the most attention and nominations are released in December/early January in order to be nominated and fresh in the judges’ minds. A welcome surprise. 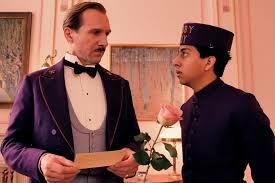 A scene from Anderson’s Grand Budapest Hotel with Ralph Fiennes and Tony Revolori. 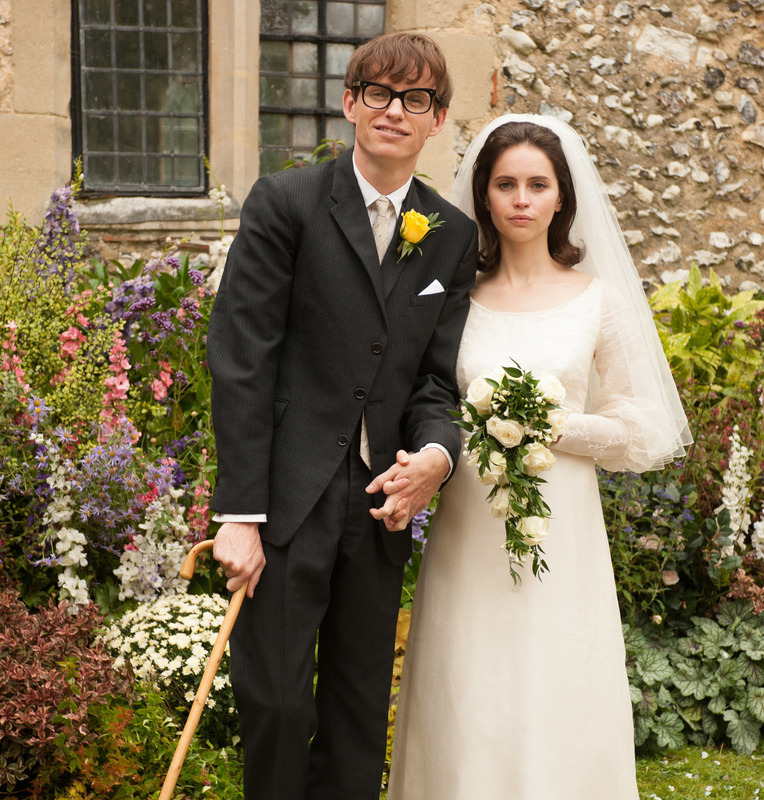 A close second in nominations is The Theory of Everything which is a biopic about Stephen Hawking and his first wife Jane Wilde. I haven’t seen this yet but it is one that I want to see this month along with Into the Woods. I had a feeling it would be up for a lot of awards especially for Eddie Redmayne who has to portray Hawking’s scientific successes with the physical transformation and effects caused by motor neurone disease. I think it will be an interesting watch. 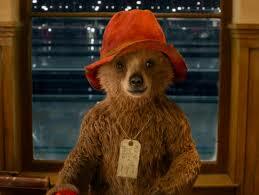 Paddington has been nominated in two categories: best adapted screenplay and outstanding British film. I really wish it had been nominated in more categories. I don’t think it will win the awards it has been nominated for because the categories are full of contenders this year and Paddington is the least likely in each category to win. This film was the surprise and one of the highlights of my 2014 cinema visits. I’d always been keen on seeing it from the initial teaser trailers of the bathroom scene. I maintained my determination amongst losing Colin Firth from the cast (although I love Colin it was probably the best decision as I don’t think his voice would have worked whereas Ben Whishaw’s fits perfectly) and my sister’s criticisms with the creepy paddington memes. The film was a delight! Extremely funny all the way through (side note: any film that comically bumps two characters into each other with Lionel Richie’s Hello in the background is a winner for me) and so beautifully filmed and put together as well. Stylistically it was wonderful especially the Wes Anderson-esque introduction to the Brown family moving through the doll’s house. I have annoyed probably all of my friends and definitely my family by telling them how good it was. I can’t wait for the DVD to come out so I can just watch it on repeat. 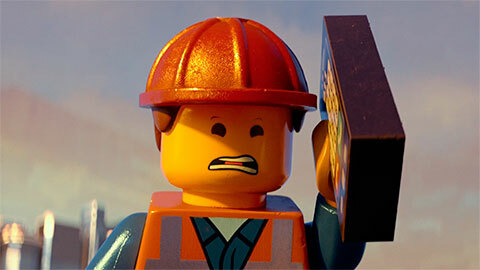 Another hilarious children’s film is nominated in the best animated film category: The Lego Movie. I saw this last year and couldn’t stop singing Everything is Awesome. I was intrigued by how the film would be animated in a lego style and I was impressed when I saw the film as it didn’t lose its character and the lego was fully recognisable in its appearance, the way it was moved etc. It was a funny film with the humour coming from many sources. However, I have to say that I think the character of Emmett provided the most humour and this is down to the actor who voiced him: Chris Pratt. I was already familiar with Chris as Andy Dwyer in American comedy Parks and Recreation. I think 2014 has really been his year with lead roles in films like The Lego Movie, Guardians of the Galaxy and it looks like he will have a strong part in the upcoming Jurassic World as he features prominently in the teaser trailer. Another film I have seen called Pride has been nominated in three categories. However, like Paddington I fear that Pride will be overlooked due to the small number of categories it has been nominated in and the popularity of the films/actors in its respective categories. Big contenders (that I haven’t seen) appear to be The Imitation Game and Birdman. There are also some nominations for more films that I haven’t seen like Gone Girl and Mr Turner but I am surprised how few nominations they have received due to the critical acclaim these films received and all the awards they were promised.